Todd Mihalovich isn’t waiting on the legal system. He kicked star running back Kee’Von Bernstine off the team today. Mihalovich is a fiery guy and took some heat when it was initially reported that he’d allowed Bernstine to practice following the charges. Bernstine’s attorney said they are looking into appealing his removal from the team. Mihalovich said he made the decision to remove Bernstine only after he’d been informed of the details surrounding the charges for the first time. I can’t blame him. It’s a stunning and disturbing read. Lincoln had no problems in their first game without Bernstine, winning 49-23 at Ottumwa. It’s another lesson in how fragile life can be. Bernstine was a prep star with big FBS college schools lining up to give him a full ride scholarship. Now he’s potentially looking at prison time. Amazing how several bad decisions can completely change lives. And if these allegations are proven true, there’s no defending this. Domestic violence and abuse towards women cannot be taken lightly. Normally if you lose your best player you struggle. Not the case for Dowling, they won their second straight without star wideout Amara Darboh. After upsetting Ankeny last week the defending state champion Maroons beat Johnston 27-14. If Darboh returns as expected by playoffs the Maroons could be even more dangerous if they’ve discovered other playmakers. Cardinals vs. 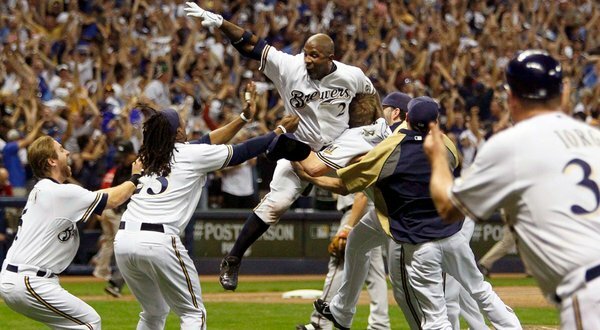 Brewers in the NLCS. Prince Fielder vs. Albert Pujols. Winner gets to go to the World Series. Loser signs with the Chicago Cubs. It was easy to forget how good Chris Carpenter is after a tough early start. Fact is the Cards need him to be this good too as shaky as their bullpen has been. The NLCS will be a lot of fun. History between the teams in the past (1982 World Series) and recently some bad blood. It’s sure as hell a lot more fun than seeing Arizona in. The D-Backs had just 38,000 show up for game four. Tampa Bay also struggled to draw in their series. It’s a shame these two teams are based in what seem like retirement communities. In St. Louis or Chicago young teams like that would be embraced and beloved. In Arizona and Tampa they’re just glad they don’t have baseball to conflict with the big bridge and jin rummy tournaments at the local YMCA. Both Iowa and Iowa State are road dogs tomorrow. Iowa has owned Penn State of late and the fighting JoePa’s aren’t world beaters this year. Sooner or later all streaks have to end, but I think Iowa finds a way to win. The key here is that Penn State’s offense plays right into one of the few strengths of Iowa’s defense. The Hawks have been strong against the run (see the Pitt game against Ray Graham) and struggled against the mobile option type QBs. PSU probably won’t be overly dynamic and is just going to pound it straight ahead. I think Iowa State is much improved on defense and can go in and limit Baylor just enough to give the Cyclones a chance. Whether or not the ISU offense can clean up the mistakes and turnovers in one week to compete in a shootout I doubt. I think it’s close for a while, but Baylor pulls away and covers. I’m headed up to Cedar Falls tomorrow as we at WHO Sports show some love for the #2 ranked Northern Iowa Panthers. UNI starts a tough stretch with 17th ranked Indiana State. Hopefully the Panthers get a good crowd as they’ll have the state all to themselves tomorrow (granted they start in between Iowa and ISU kickoffs at 4). It’s my first trip to the UNI Dome, though I’m sure I’ll make plenty more for state football and any UNI playoff games. It’s the fourth time I’ve shot a game in a dome (Metrodome and a couple on the Dakota tundra) and I absolutely hate them. If the crowd is big and into the game it helps, but walking into a dome is like walking into a smoking break room. I don’t care if it’s -10 with a blizzard in the winters, football should be played outdoors. Layer up and sack up. That video from the Metrodome roof collapsing? I wish that would happen at every dome in America. I hope you're pleasantly surprised by the UNI-Dome. Maybe, as a recent grad, its the emotional attachment I have to that building, but I would give a lot to be there for the game. When there's a big crowd, and its third down in a tight game, its an absolute electric atmosphere. Have fun! And Go Panthers!